After I start a battle, the mod in open, but then after a minute, it closes and I cant use it. What's the problem? Attached is a screenshot of the tracert command. Seems to be working better now. From your posts, it seems your server was having some temporary connectivity issues. All is better now. It's doing it again. I will play a few battles (or sometimes only one battle) and everything will be fine, and then all of a sudden, all of the graphics, rainbow lines, and aim pointers disappear. However, if I click the right mouse and enable auito fire, the mod will auto fire, even though it is now invisible. So the mod is still running in the background, but the GUI is gone. Even at the port after a battle, the mod menu is no longer there, but auto aim and fire I can still get to work without seeing the GUI. I have no other mods installed and have deleted the dll file multiple times and restarted the game. What game are we talking about ? World of Warships. Sorry about that. 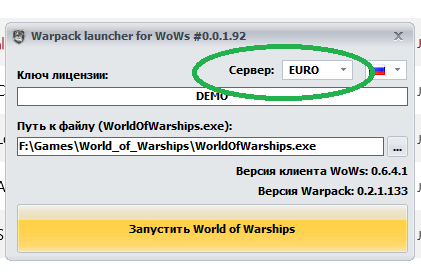 Select the Euro server in the launcher. Okay. I will try it and let you know if it fixes it. I have been using the "auto" setting. Then put the Chinese server. I studied your messages in this topic in more detail, you are using in combat key F12 ? This key completely removes the interface of the warpack and returns it . That might be it. That key sends an in-game message. I think that may have fixed it. I'll let you know if it stops working. And one more question: did you end up fixing the ban detection from a couple months ago? A couple months ago people were getting banned using this mod and I haven't seen anyone post that they've been banned since then. Since then, no one has reported account suspension .